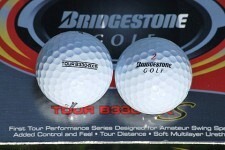 The Bridgestone B330-RX series changed the golf ball market when it came out a few years ago. Finally there was a ball specifically designed for guys like me, with swing speeds less than 105mph. Many companies have released their own versions of this type of ball, but nobody has done it better than Bridgestone so far. The RX and RX-S are very similar in that they’re designed for lower swing speeds, less than 105mph or so. My swing has dropped quite a bit from 105 to 95 in the last couple of years (hopefully due to shoulder injuries and not old age), so the RX has helped me gain some distance back. The RX-S model is a little higher spin than the regular RX and for me actually goes a little farther than an RX, nine yards. If your swing speed isn’t quite that of a tour player, and you should really get it checked via a Bridgestone ball fitting or on a launch monitor. A ball like the RX or RXS may benefit your game. Good balls but a little pricey for many. Bridgestone’s mid-handicap line is a fine group of balls for the budget conscious golfer. The e-5 in particular, is 2-piece ball for distance with a urethane cover to give great spin around the green and is $10-$15 cheaper than the RX line.